Do you remember this lovely little book? 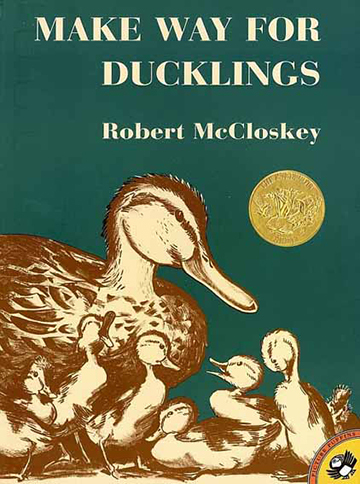 Robert McCloskey published Make Way for Ducklings in 1941, inspired by the days he spent feeding ducks at Boston’s Public Garden as an art student in the early 1930s. 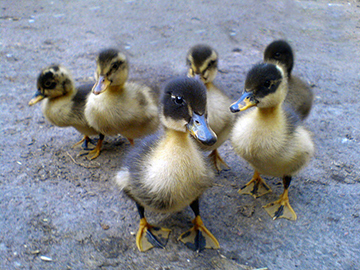 Later, while illustrating the book, he brought six ducklings home to share his studio apartment in New York’s West Village. 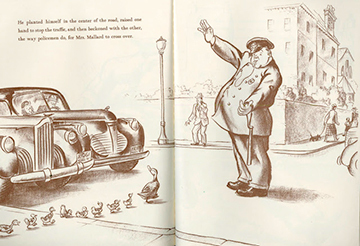 In the story of Mrs. Mallard and her brood, a kindly Boston police officer named Michael, who once enjoyed feeding peanuts to the Mallards, stops traffic for the web-footed family to cross a busy street. 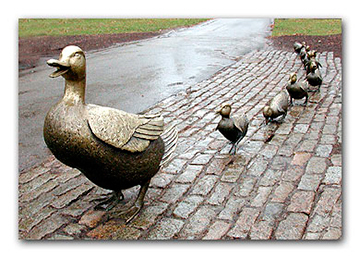 The city of Boston erected a bronze statue of Mrs. Mallard and her ducklings in the Public Garden where McCloskey’s tale began, and since 1978, the city has hosted an annual Duckling Day parade each spring, in which children and their parents dress as ducks and ducklings. Driving on the way to float on the Snake River, a mom and 5 ducklings decided to cross the street . Everyone in both directions stopped to give them plenty of space and time! We all immediately want to protect these innocent creatures just going about their day. I agree there is a hidden lesson there!! Thanks! This was a beautiful thing to wake up to! One of my favorite moments on my first trip to Boston was seeing the bronze ducklings and their mama, just before our ride on the Swan Boat. If you go to Boston, don’t miss the Gardens! That was nice to see! We’re exposed to so much cruelty and neglect of our animal friends, it was nice to see that officer take the time to stop and make sure the ducklings and mama duck made it to the side of the road safely! Oh my gosh! I do remember the book! Does that ever bring back memories! Just purchased a used copy of that book for my toddler nephew.